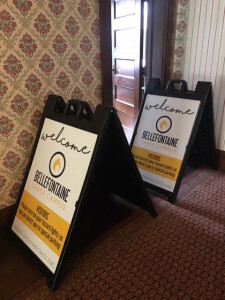 Bellefontaine Grace, a new campus of Grace Church, Marysville, Ohio (Clancy Cruise, pastor), launched regular Sunday services on Easter morning with 250 people in attendance. The Bellefontaine campus is rooted in a desire for the Marysville church to mulitply. Several years ago, the pastors, elders, and missions team began to pray about when and where the church could further reach out to the area surrounding Union County. In 2014, it became clear that God was opening doors in Bellefontaine to plant a new church campus. The purpose of the church was to be light, not to replace or compete with other churches. In 2015, Life Groups began to meet under the leadership of Daniel O’Kane. Life Groups in Bellefontaine continue to grow, and Daniel is now on staff at Marysville Grace as the Campus Pastor for Bellefontaine. In September 2016, BGC will begin to meet for regular worship services. In 2015, Life Groups began to meet under the leadership of Daniel O’Kane, who serves on staff at Marysville. The groups in continued to grow, they began meeting monthly for worship in September 2016.